I did the track on a relatively dry day, but there was still a bit of water and mud around, big deep ruts and some big muddy bog holes near the end of the tracks. 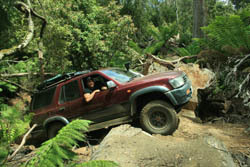 Locals that i spoke to recommended not doing the track without a winch. I found that i didn\'t need it but if it was anymore wet i may have come up short without a winch. The best way to get to it is by going through Pyengana which is just inland from St Helens and heading to the Columbia Falls, once at the falls you will find the road has a sign saying no through road, this is the start of the track so just follow it through and continue over the gravel track that you will come to after a couple of kms, this is where it starts to get interesting!